Blurb: Jodi and Todd are at a bad place in their marriage. Much is at stake, including the affluent life they lead in their beautiful waterfront condo in Chicago, as she, the killer, and he, the victim, rush haplessly toward the main event. He is a committed cheater. She lives and breathes denial. He exists in dual worlds. She likes to settle scores. He decides to play for keeps. She has nothing left to lose. 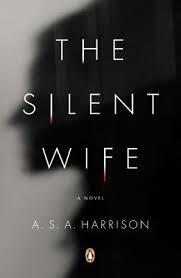 Told in alternating voices, The Silent Wife is about a marriage in the throes of dissolution, a couple headed for catastrophe, concessions that can’t be made, and promises that won’t be kept. Review: I purchased this book new in 2014. And then I proceeded to do as I always do … I let it linger on my shelf. I have no idea what made me pick this one up, but it caught my eye when I went searching for my next read after finishing up Misery. So what did I think ….hmm. This is a tough one. What do you get when you absolutely hate both main characters? Because one is so stupid and the other is in such denial you want to slap her upside the head? Yeah. That’s where I’m at on this book. Todd is a class-A jerk wad. A cheater. Jodi needs to get her head out of the sand. Even after Todd leaves her for Natasha she’s in such denial that I wanted to strangle her. But for some reason I kept reading this book. I was sucked in for whatever reason. I couldn’t tear myself away from the book (when I got the chance to pick it up … reading with 2 little ones is a whole different ball game). I had to know what happened. Little by little the book unfolds and I was left holding my breath until the very end. This is not necessarily a fast-paced thriller. It’s more slow-paced, but every bit as intriguing. Bottom line … I enjoyed this one, but ultimately it was my distaste for Todd and Jodi that is keeping my opinion of this one more on the “okay” side than the “awesome” side.